“By forcing light to go through a smaller gap than ever before, researchers have paved the way for computers based on light instead of electronics. Dr Michael Nielsen, from the Department of Physics at Imperial, said: “This research has ticked one of the boxes needed for optical computing. Dr Rupert Oulton, from the Department of Physics at Imperial said: “The use of light to transfer information has gotten closer to our homes. 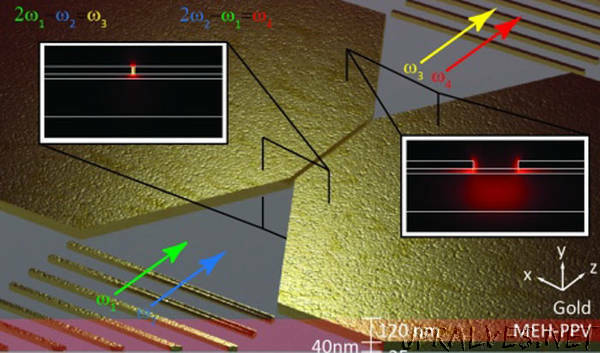 As well as providing an important step towards optical computing, the team’s achievement potentially solves a longstanding problem in nonlinear optics. Since interacting light beams with different colours pass through a nonlinear optical material at different speeds, they can become ‘out of step’ and the desired effect can be lost.